I made the first beer in years that I liked, just sampled it the other day. It was a small 1.5 gal batch of malted barley and malted corn (4:1), infusion, fuggles hops early addition and nottingham yeast. I went nuts trying to keep clean and it paid off! I sugar primed a small sample, let it bottle condition and it was great. I then wanted to carbonate the rest in PET bottles with a carbonator cap and realized my tank was empty and no one fills them on Saturdays - bastards! Here's my rapid carbonation method. 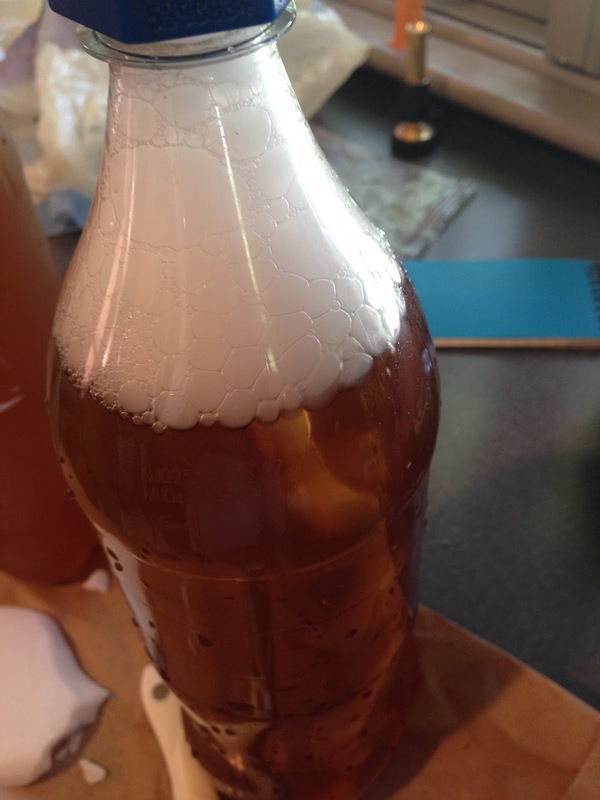 I popped 5 grams of dry ice into each liter of brew and capped it securely. It dissolves in a few minutes. I'll chill and it's ready. I'll let you all do the calculations to confirm I placed the equivalent of 2.5 volumes of CO2 in each liter of beer. And don't worry, no need to use the Redlich-Kwong equation of state (that's a joke). 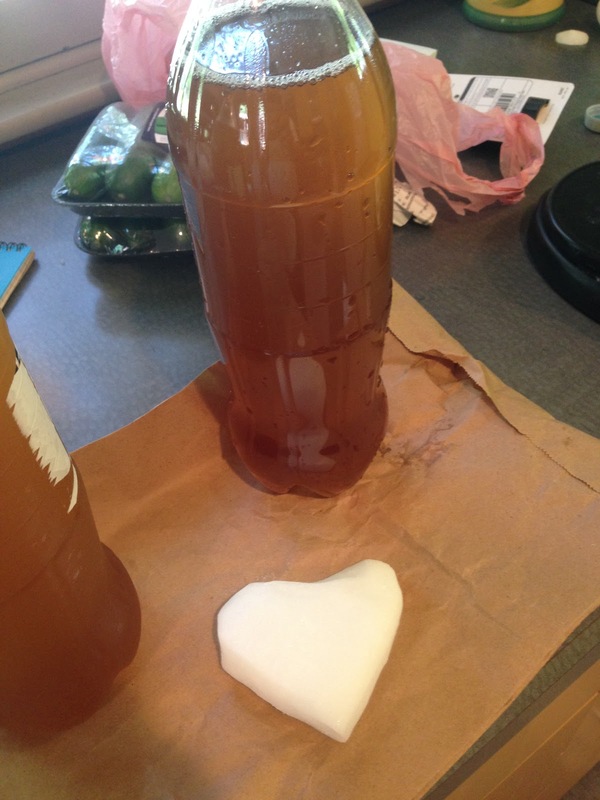 Here's a pet bottle with the flat beer dispensed from my secondary and a block of dry ice from Graeter's. 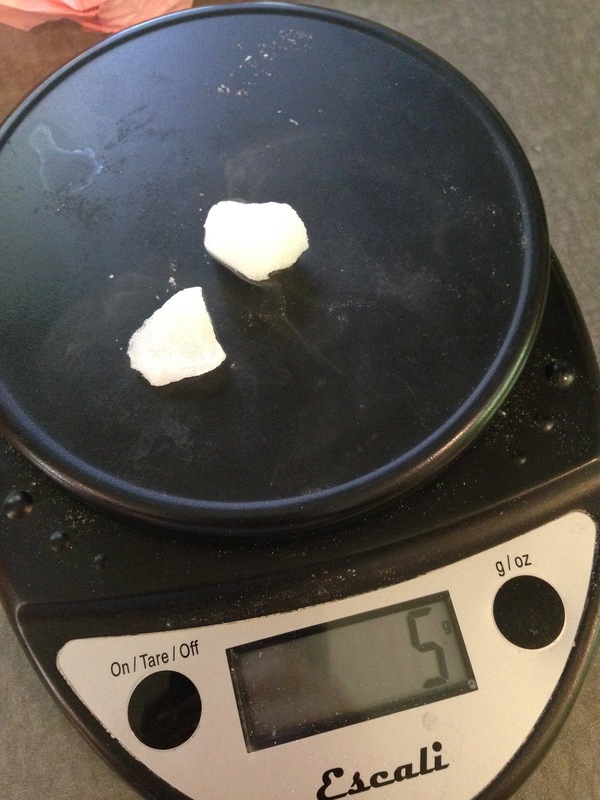 I pounded the piece into little pieces and weighed out 5 grams. Tossed the CO2 chips in, capped it and tossed the bottles in the fridge. 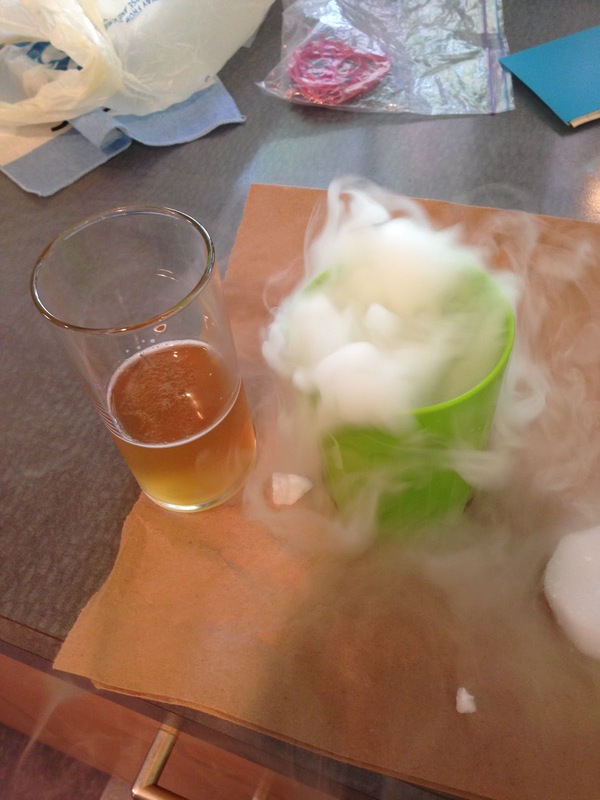 Then the extra dry ice was used for my amusement. I tossed some in warm water and watched it. I also tossed some chips in my mouth and pretended I was a rabid dog with all the smoke pouring out of my mouth. The girls were away, so no one could see how hilarious I was. Warning: I have put dry ice in my mouth a thousand times, it was one of the many ways we'd amuse ourselves in graduate school - I am a professional! This can result in a great deal of harm if done incorrectly. sous vide in the oven? I placed 3 qts of water and a thermocouple datalogger in the oven over the past couple days to see if an oven could hold a stable temperature. The water's heat capacity certainly helps to smooth out the fluctuations, but I didn't realize how much. This is just an excerpt of many hours of evaluation, but wow, it's pretty darn stable. I was also surprised how much lower the temp of the water was compared to the atmosphere inside, must be the inefficiency in heat transfer? Whatever, looks good enough to plan a big slab o steak! In all 3 temp ranges, I didn't wait long enough for complete equilibration, but it looks promising. Click on image to make it more readable. Given the length of time required to equilibrate this system, it's lame compared to any circulator, but still a fun observation and good for intermittent use. 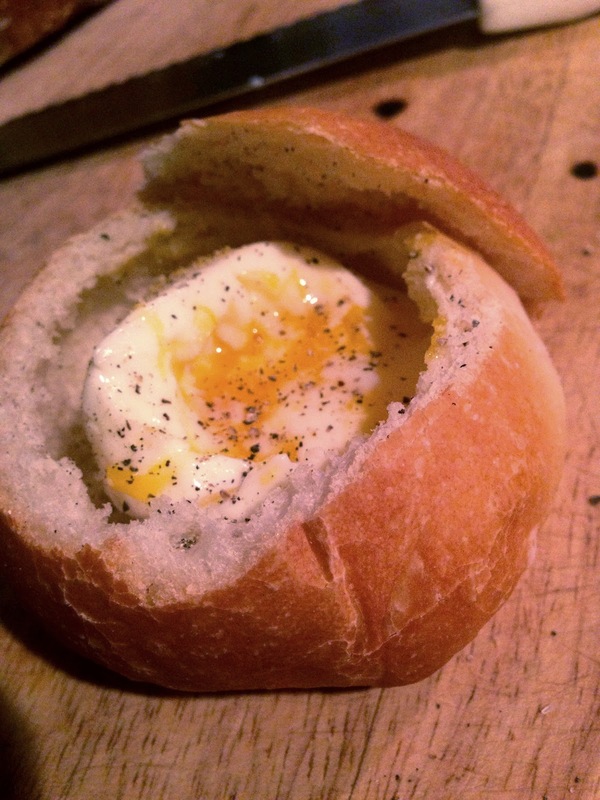 I've been watching The Mind of a Chef series on Netflix, this popped up on season 1, episode 4, a cool way to poach an egg. Here's how it played out during my morning. 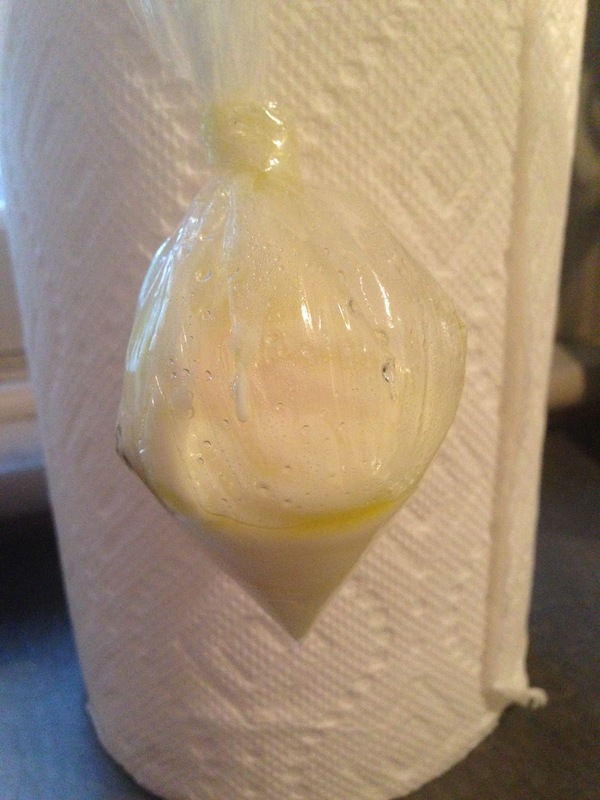 A 1 gal food storage bag was lightly oiled on the inside corner, an egg cracked into it and the bag was tied off leaving an air gap (oops). It was tossed in water that was boiling and then left to simmer, ca. 190-200F. Then I realized I lost my credit card for the second time in a month last night at Crest and ran around the house checking clothes pockets looking for it. So, I'm not sure how long it cooked, ca. 7 minutes. The unused portion of the tied off bag just rested on the side. 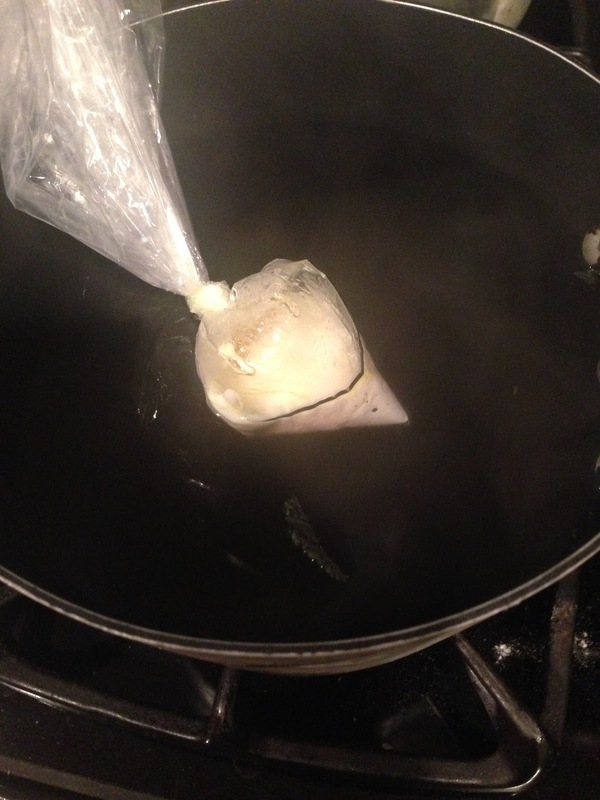 The air bubble enabled the egg to float, I should've trimmed the excess bag. Having realized my credit card was gone and unable to call Crest for yet another couple hours, the effort continued. The egg bag removed and displayed for a photo op. 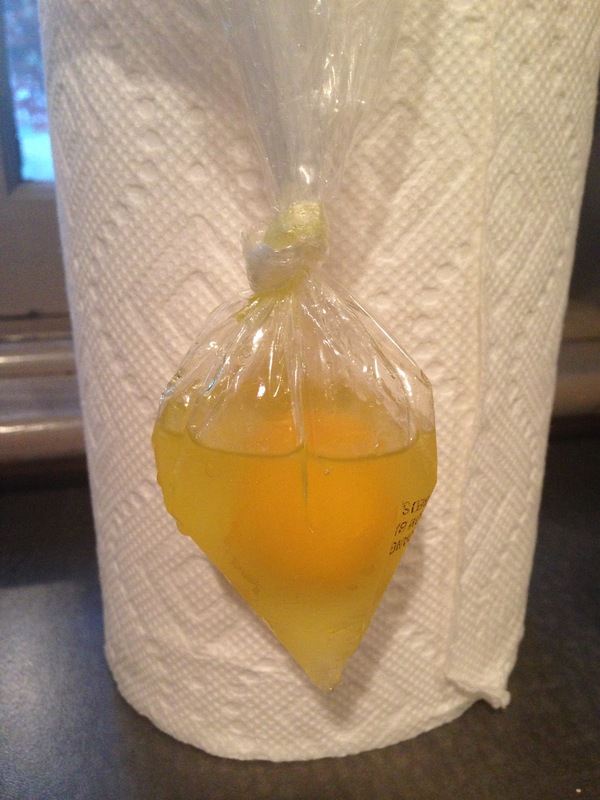 The bag was snipped away and the egg popped out. 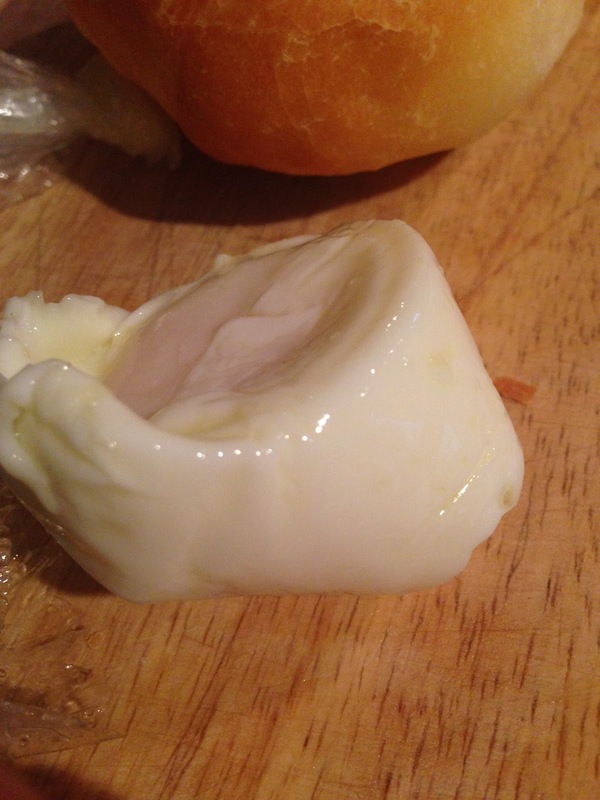 Despite the longer than intended cooking, the yolk was still kind of soft. Some mini boules had just popped out of the oven, one was hollowed out to swaddle the just cooked egg and a little salt and pepper were added. Down the hatch. This is great, no streams of egg white running around the water, many eggs could be done at once, if I don't lose my credit card, I can quite likely control the cooking a little better. Do this people!